It's Christmas! Christmas time in England is synonymous with roaring log fires, great food and fine wine; not to mention festive cheer and laughter. Enjoy mince pies and mulled wine by the fire, lit by the twinkling lights on the tree. Why not make this Christmas one to remember by staying in a cosy country inn or hotel in the company of family and friends, or as a special treat for you and a loved one. Many hotels and inns offer a full itinerary for their Christmas breaks, including meals and entertainment. 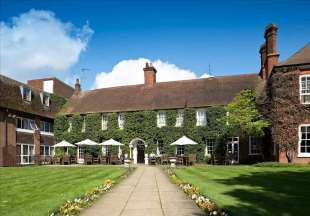 Other inns favour a more chilled out, relaxing holiday with the emphasis on good company, great food and personal service. Traditional Xmas Lunch is usually included in your Christmas break; please see the individual hotel descriptions for full details of what is included. All our 2018 Christmas offers, some exclusive to English Country Inns, are regularly updated so be sure to keep checking back! 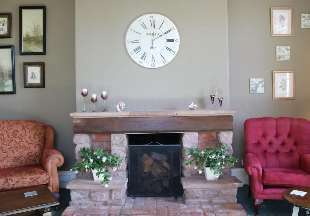 Spend Christmas at Corner House Hotel is a stylish and comfortable hotel located in the Somerset County Town of Taunton. Arrive on Christmas Eve to a Somerset Afternoon Tea. At 7pm pre-dinner Champagne and nibbles will be served in the bar followed by dinner from the seasonal menu. If you choose to go to Midnight Mass, hot chocolate and mince pies will be ready on your return. Wake up on Christmas Day to a continental breakfast buffet. Christmas Day Lunch will be served at 12.30pm. In the evening a light evening buffet is served whilst you relax and unwind. Boxing Day starts with a full Somerset breakfast. The rest of the day is yours to spend at leisure. Staff will be on hand to recommend things to do and restaurants for dinner. The 27th December starts with a full English breakfast before leaving the hotel. 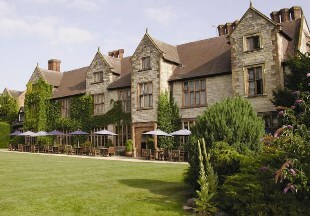 Hall Garth Hotel is a 15th century manor, originally part of the Bishop of Durham’s estate. The perfect place to spend Christmas. Christmas Eve: Arrive on Christmas Eve to Afternoon Tea. In the evening a buffet dinner will be served followed by entertainment to get you into the festive spirit. Christmas Day: Begin the day with a hearty breakfast. After exchanging gifts, enjoy a sumptuous Christmas Lunch. In the evening, a buffet dinner will be available. Boxing Day: After breakfast, spend the day at leisure. In the evening dinner will be served followed by a fun quiz. 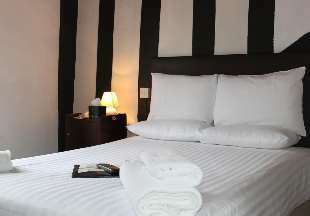 The Red Lion Hotel is a Grade I listed building in the heart of Colchester with original Tudor features. Christmas Eve: Once you have settled into you room, enjoy a three-course dinner to music. If you wish to attend a midnight service, mulled wine and mince pies will await your return. Christmas Day: Start the day with a hearty English breakfast and morning coffee with homemade biscuits in the lounge before the main event… the traditional festive lunch. In the evening there is an informal finger buffet dinner. Boxing Day: Wake up to a leisurely brunch before spending the day as you please. In the evening a fabulous dinner will be served. 27th December: Start the day with a hearty breakfast before saying goodbye. 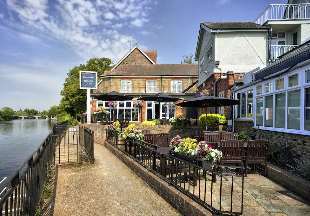 Spend Christmas on the Thames within easy distance from Windsor & London. Christmas Day: Start the day with a hearty English breakfast. A four course festive lunch with all the trimmings. Watch the Queens Speech with a slice of homemade Christmas cake. Enjoy a three course dinner in the evening and take part in the infamous hotel quiz. Bottle of Champagne for the winner. 27th December: Start the day with a hearty breakfast before departing. 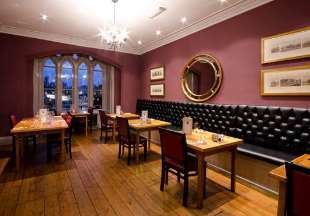 Welcome to the Mercure Bush Hotel, a beautifully restored 17th century coaching inn. Arriving on Christmas Eve, in the evening join us for a drinks reception followed by a three-course dinner. Christmas Day: breakfast before spending the morning at leisure. A festive four course lunch with all the trimmings is then served. In the evening join us for a light buffet. Boxing Day: Leisurely breakfast. Relax and then join us for a delicious three-course Boxing Day lunch. A light evening buffet will be served in the evening. Tuesday 27th December: Depart after breakfast. Spend Christmas high above Stroud on the wilds of Rodborough Common. Arriving on Christmas Eve to a full Afternoon Tea then relax into your room before a glass of Champagne and a sumptuous four-course dinner. For those who wish to attend a Midnight Mass service, hot chocolate and cookies will be served upon your return. Wake up on Christmas Day to a traditional Cotswold breakfast with a Bucks Fizz. After breakfast, there is time to open presents ebfore Christmas Day lunch with all the trimmings. In the afternoon, tea and Christmas Cake will be served and if you have room, in the evening a buffet supper will be served. Boxing Day starts with a Cotswolds brunch. In the evening a four course dinner will be served accompabied by music entertainment from a harpist. A 17th century former farmhouse offering an intimate and historical setting. Arrive on Christmas Eve to Mulled Wine and Mince Pies to enjoy around the open fire. That evening enjoy a candlelit dinner starting with a complimentary cocktail and accompanied by a vocalist singing swing.
. On Christmas Day, wake up to a Yorkshire Breakfast before enjoying the rest of the morning at your leisure. At 12noon, join for a glass of fizz followed by a superb 4 course lunch finishing in time for the Queens Speech. In the evening, enjoy a buffet dinner followed by a Christmas fun quiz.
. Wake up on Boxing Day to your final Yorkshire Breakfast before saying goodbye after a fabulous Christmas. 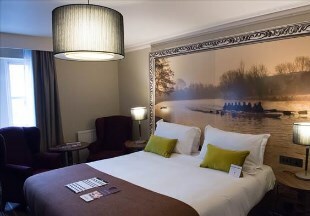 Located in the village of Barford within a stone throw from Stratford-upon-Avon and Warwick is the Glebe Hotel, a Georgian-style hotel with individually styled bedrooms, excellent food and fantastic leisure facilities. Arrive on Christmas Eve to afternoon tea and cakes followed by a three course dinner accompanied by a local choir singing traditional Christmas carols. Hot punched is served after the local church service. Wake up on Christmas Day to breakfast in the Conservatory Restaurant. A five course Christmas Day Lunch will be served between 12.30pm-3pm. Some board games will be available for you to enjoy before the buffet style dinner in the evening. Boxing Day begins with breakfast in the Conservatory Restaurant then explore the local area or book Boxing Day Lunch (extra charge) at the hotel. In the evening, a three course dinner will be served. On the 27th, enjoy a traditional full English breakfast before setting off home. 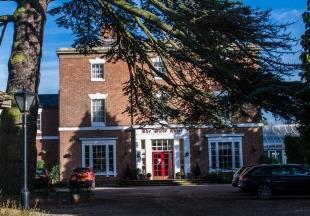 Enjoy the festive period at the Pilgrim Hotel, a lovely Victorian Country House Hotel. 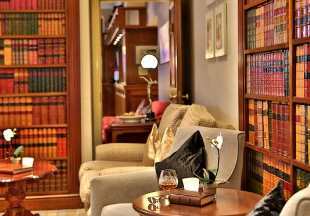 Arrive on Christmas Eve to a warming glass of mulled wine and brandied mince pie in the cosy bar next to the roaring fire before settling into your room. Before dinner, meet other guests and staff in the bar for canapes and pre-dinner cocktail before the candlelit a la carte dinner. Christmas Day begins with a full English breakfast, Bucks Fizz and a gift from the hotel before spending the rest of the morning at your leisure. Christmas Lunch is a elegant four course meal and then in the evening a buffet is available to be eaten at your leisure. Boxing Day includes a late brunch before you can go and explore the local area. On return a delicious afternoon tea will await you and in the evening a candlelit three course farewell dinner. The next morning a hearty full English breakfast is available to bid you a fond farewell. 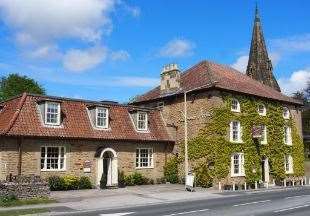 This 17th century coaching inn now boasts an AA Rosette awarded Brasserie & Bar. Arriving on 24th December with a festive cream tea served in the Library Lounge & Bar followed by an evening drinks reception and a special festive three-course dinner. For those that would like to attend Midnight Mass at one of the local churches, mulled wine and mince pies will be served on your return. Christmas Day starts with a hearty English breakfast, then time to open your presents before the main event. A four-course festive lunch will be served with all the traditional trimmings. In the afternoon, settle down with The Queens Speech and a slice of homemade Christmas cake. In the evening enjoy a festive buffet dinner. Boxing Day begins with a leisurely brunch in the restaurant. Then set your own pace for the morning, join the guided walk of city or relax at the hotel. For the final evening, join for a special dinner served in Marco's New York Italian Restaurant accompanied by the resident magician. Before setting off on your journey home, a hearty brunch is served before departing at your leisure. 24th December: arrive from 3pm to be greeted with mince pies, crumpets and tea cakes served with mulled wine, hot chocolate, tea or coffee whilst listening to carols. 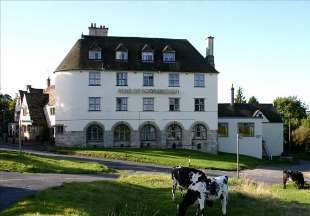 the hotel. Dinner in the evening. Christmas Day: After a hearty breakfast, the morning is yours to spend as you wish before returning to the hotel for a festive lunch where guests will be seated on tables of 10. After lunch join our Christmas fun quiz and watch the Queens Speech. In the evening a light buffet will be served. Boxing Day: After brunch, a coach will then take our inhouse package guests to The Salisbury Playhouse to enjoy the pantomime before returning for an evening buffet. 27th December: Breakfast before departure. 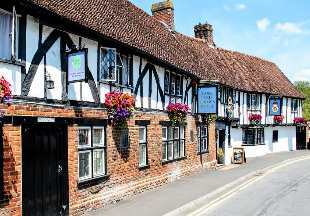 An 16th centruy Elizabethan House boasting a 2AA Rosette Awarded Restaurant. Perfect for exploring Shakespeare country. Arriving on 24th December, a selection of homemade cakes, tea and coffee will be served in the Great Hall between 2pm-4pm. In the evening, mulled wine and a 4 course dinner is served in one of the restaurants. Breakfast. Christmas Day lunch starts with a glass of fizz, followed by a 4 course traditional luncheon. In the evening, a buffet will be served with musical entertainment. Breakfast. Afternoon Tea will be served on Boxing Day between 2.30pm and 4pm. An evening drinks reception will take place before sitting down to a 4 course dinner with musical entertainment. Before setting off on your journey home, join for the last breakfast of your Christmas break. 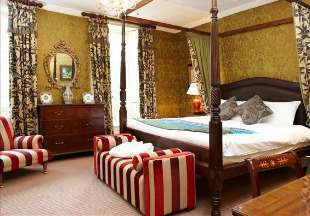 Spend Christmas overlooking Lake Windermere at Cragwood Country House Hotel. Arrive on Christmas Eve to a welcoming Cream Tea. If you choose, transport to the local church at 5pm is provided. 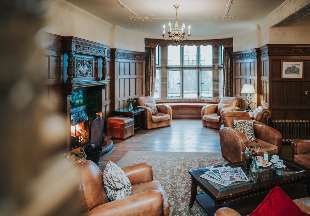 In the evening, head to the old hall for a glass of fizz followed by a Cumbrian buffet dinner. Merry Christmas! It’s Christmas Day and a leisurely continental breakfast will be served in your room. At noon, there will be a Bucks Fizz toast before indulging in the traditional Christmas lunch with all the trimmings. In the evening, a Christmas cocktail is on the menu and a fabulous festive buffet followed by the Cragwood Quiz. Boxing Day kicks off with a Victorian Breakfast then head down to the Cragwood jetty for a lake cruise on Windermere. Mulled wine and mince pies will warm your insides as you take in the spectacular scenery. On return to the hotel, lunch will be served. At 4.30pm, tea and cake will be served. In the evening, a fabulous five course black tie dinner will be served followed by the excitement of a night at the Casino. Once the 27th December is upon you, its time to head home, but not before a full English breakfast. Arriving on Christmas Eve, you will be welcomed with a delicious afternoon tea. Then join us for a three-course candlelit dinner accompanied by our harpist. Afterwards relax in the lounges and listen to our duo 'Rag Tag Misfits'. Christmas Day: Celebrate with Buck’s Fizz breakfast before spending the morning at leisure. Keep a look out for Father Christmas! A traditional Christmas Day lunch with all the trimmings is then served. In the evening join us for a Yuletide Buffet. Boxing Day: Enjoy a leisurely breakfast. Then we set sail for our ever popular Windermere cruise where you can discover the fells from the water: our musical entertainment will keep everything up beat while lunch is served on board. On your return there is time to relax before dinner is served with musical entertainment from our Harpist. After dinner, music and dancing with the Rag Tag Misfits. Tuesday 27th December: After a hearty Cumbrian breakfast it's time to say goodbye. 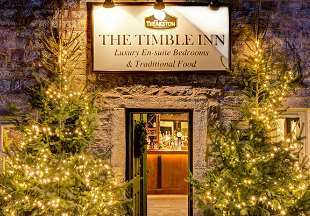 Enjoy the festive period at The Timble Inn, a romantic 18th century Grade II listed coaching inn. Arrive to a warm welcome at The Timble Inn with cakes and hot drinks before being taken to your room where Champagne and Chocolates await. On Christmas Eve evening choose from the specially constructed a la carte and classic menus. As you peruse the menu, sip on your complimentary glass of Champagne. As you wake up on the day of the big event, a full Yorkshire breakfast will await. Then join your fellow guests in the lounge for Champagne and Canapes before your Christmas dinner. In the evening, each room is presented with a luxury grazing hamper. Boxing day starts with breakfast and closes with another glass of bubbly and dinner.